Gabriela Hasbun for The Wall Street Journal. Dog breeding expert, Marina Hall Phillips, with a litter of yellow labradors. Marina Hall Phillips calls herself a “crazy, passionate dog person.” But as a puppy breeder, she spends more time studying spreadsheets than visiting kennels. In her current work as a consultant, she advises dog organizations about breeding and puppy development. And as the head of Guide Dogs for the Blind’s breeding department—a position she held for more than a decade, until last year—she oversaw the raising of about 10,000 puppies for the national organization and managed what is today one of the largest dog-breeding colonies in the U.S.
“She’s created exceptional puppies for us,” says Brent Ruppel, Guide Dogs’ director of community programs. She starts with a list of the specific traits desired in a dog. Guide Dogs, a nonprofit group founded in 1942 to provide assistance dogs to seeing-impaired servicemen returning from World War II, sought dogs that were healthy, compliant and eager to please. These days, it provides around 300 dogs every year to blind and seeing-impaired people at no charge. To help her better understand how to breed for the preferred traits, Mrs. Phillips reached out to Thomas R. Famula, a quantitative geneticist and one of her former professors at the University of California, Davis, where she graduated with an undergraduate degree in animal science and psychology in 1991. Nature and nurture both count. Using Dr. Famula’s analysis, Mrs. Phillips estimated that 41% of those qualities could be bred for; the remaining 59% come from environment and training. Because Guide Dogs’ colony is now more than six decades old, she was able to trace character traits and qualities generations back. “Each individual dog carries the wealth of its ancestral history,” she says. She introduced a more sophisticated way to quantify a dog’s traits, assigning numbers between one and four to such qualities as confidence, sociability and physical condition. Ultimately, each dog would be assigned a compound number—known as its estimated breeding value—ranking it against other dogs in the program and predicting its potential to produce future guide dogs. Marina Hall Phillips with some young labs. She approaches the dogs at the bottom of the list unsentimentally. She retires breeders that aren’t up to the job—either because the litters are too small or the temperaments of the puppies they produce aren’t suitable. “Dog breeding is mostly an art, but Marina brings more science to the process,” says Dr. Famula, who continues to consult for Guide Dogs and other assistance dog organizations, as well as for the cattle industry. 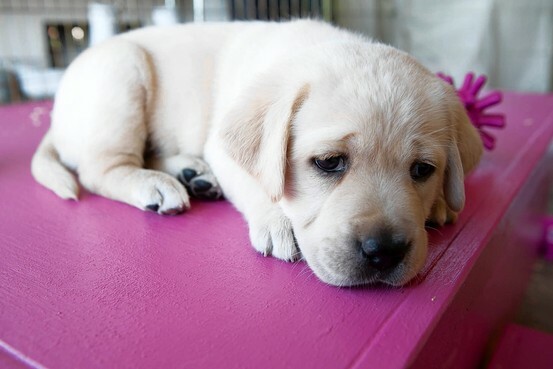 When Mrs. Phillips first became Guide Dogs’ breeding manager, in 1999, the colony had a problem with puppies that had difficulty swallowing milk, due to a genetically heritable condition. Through breeding choices, she quickly solved the problem. One risk in managing a breeding colony is what is known as “kennel blindness”—a breeder’s inability to see the faults in his or her own kennel. Forging partnerships with assistance guide organizations in Korea, Japan, the Netherlands and elsewhere helped to avoid bias. It also added genetic diversity to the colony, by swapping puppies and breeding dogs with them. She is convinced that she has learned more from her mistakes than from her successes. “You learn more from your bad dogs than your good dogs,” she says, as long as you try to figure out what went wrong. A bad dog is one with a health, behavioral or other problem that makes it unsuitable as a guide dog. After Mrs. Phillips retired from Guide Dogs last year, she founded a company called Phillips Next Generation, which offers consulting services to the assistance-dog industry. Mrs. Phillips remains passionate about her own dogs—a petite mixed-breed named Biko, a Golden Retriever named Tassel, five new yellow Labrador retriever puppies she’s raising for the nonprofit group Canine Companions for Independence, their mother Kamela, and a black Lab breeder named Kathleen. A version of this article appeared November 2, 2012, on page C11 in the U.S. edition of The Wall Street Journal, with the headline: A Breeder’s Quest for Perfect Puppies.